The fiscal year 2018 budget plan the House Budget Committee approved in July calls for a radical change in the Earned Income Tax Credit (EITC) that could harm millions of low-income working families and cause serious problems for the IRS in processing tax returns. The budget would delay EITC payments indefinitely each year until the IRS verifies every EITC filer’s income. This would entail the IRS corroborating the income information for 28 million tax returns each year, a massive undertaking that almost certainly would require months of work and would interfere with the IRS’ ability to perform other functions unless Congress raised IRS funding sharply. In addition, while the proposal is designed to produce savings, it might actually result in net revenue losses. The IRS seeks to direct its enforcement resources to areas where the return on investment is greatest — i.e., where the revenue protected or recovered is the largest per dollar of enforcement resources invested. The IRS already is greatly overstretched, however, especially since Congress has cut its funding by 18 percent since 2010, after adjusting for inflation, and the fiscal year 2018 House appropriations bill would shrink it further. Without a steep increase in the IRS budget, this proposal would require the agency to shift resources away from areas with a higher return on investment — curtailing other enforcement activities and sharply reducing audits and other compliance activities aimed at high-income households and corporate entities suspected of tax evasion — in order to conduct mini-audits of all 28 million EITC filers. Yet EITC overclaims makeup only 3 percent to 4 percent of the total tax gap, and 4 to 7 percent of the individual income-tax gap. Moreover, while EITC audits already constitute 39 percent of all individual income tax audits that the IRS conducts, they result in only 7 percent of the additional tax that audits find to be owed. The House Budget Committee proposal might even increase EITC errors if the IRS had to shift resources now used for more intensive scrutiny of questionable EITC returns to rote verification of the income on every return claiming the EITC. That’s because EITC errors involving the residence of children claimed for the EITC, or their relationship to the tax filer who claims them, are the single largest source of EITC overclaims — and are costlier and more complicated for the IRS to resolve than overclaims due to income-reporting errors. The IRS now uses an array of “fraud filters” to select EITC claims that are likely to have child residency or relationship errors for further examination. (IRS’ EITC compliance efforts averted or recovered $5.7 billion in EITC overclaims in 2016, the most recent year for which these data are available.) 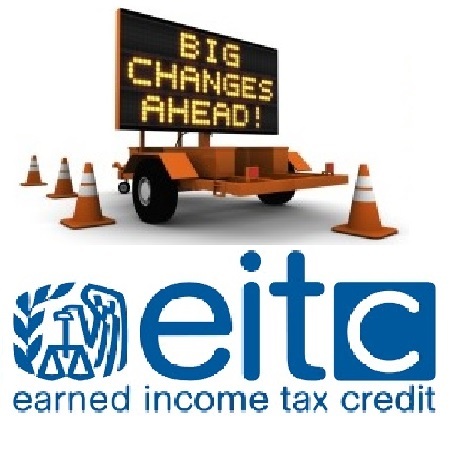 If, however, the IRS is required to conduct income verification of every tax return claiming the EITC, that almost certainly would substantially reduce the resources for examinations of EITC claims with questionable residency or relationship information and thus might result in a net increase in EITC overpayments. As a result, the proposal could lose revenues, unless the new burdens and red tape it imposed on lower-income families deterred a significant number of eligible families from claiming the EITC (or led some of them to give up during the audit process), an all-too-real possibility. But adding to taxpayer burdens and deterring honest, eligible working-poor families from claiming a tax credit for which they qualify would not constitute sound tax policy. The proposal also would greatly increase EITC administrative costs. As the IRS has noted, EITC administrative costs equal less than 1 percent of the benefits provided, in contrast to non-tax benefits, in which administrative costs related to determining eligibility constitute a considerably higher percentage of program expenditures. Nina Olson, the IRS’ National Taxpayer Advocate, has observed that if the IRS were to increase the amount it spends on EITC verification to a comparable share of benefits, little or no net savings would likely result because of the greatly added administrative costs. Furthermore, delaying EITC refunds for months would carry a high cost for many low-income families. Research shows that many working-poor families with children catch up with and pay back bills for basic household expenses when their annual EITC arrives. A survey of EITC filers in 2015 found that 80 percent used their EITC refunds to pay utility or rent or mortgage bills or credit-card debt, and nearly half repaid high-interest payday loans. A majority of the filers spent most or all of their refunds within a month — further indication of the pressure to pay bills. In particular, other research shows that the EITC helps many who have fallen behind on rent to avert eviction, and that eviction rates fall significantly when EITC refunds arrive. Multi-month delays in receiving the EITC would, therefore, cause considerable hardship for very large numbers — likely millions — of low-income working families. Such delays would almost certainly result in a rise in evictions and risk harm to substantial numbers of low-income children. The delays would place many more low-wage working families in financial jeopardy, even though the large majority of these families ultimately would be found to have reported their income honestly. The problems could be particularly acute for small-business and other self-employed filers, as discussed below. This proposal also appears to ignore the battery of provisions to combat EITC errors and fraud enacted in late 2015, which Senate Finance Committee Chair Orrin Hatch called “the most robust improvements to address waste, fraud, and abuse in the tax code in nearly 20 years.” Those measures include a several-week delay in issuing EITC refunds — until after February 15 — for those who file before that date, so the IRS can conduct basic document-matching to W-2 and 1099 forms before issuing EITC refunds, and the IRS now also conducts such matching for those filing after February 15. The House Budget Committee is calling for imposing what would likely be multi-month delays, without waiting for results on those 2015 measures (which have now begun to take effect) and without any pilot testing. By contrast, in 2003-2005, the IRS conducted pilots in several locations to test the efficacy of requiring EITC claimants with children to provide, in advance, documents on the residency of the children they are claiming. The pilot results showed this would not be a sound use of IRS compliance resources. Finally, the proposal overlooks other, more cost-effective ways to reduce EITC overpayments, such as acting on a Trump Administration budget request (also included in Obama Administration budgets) to give the IRS the authority it needs to reduce EITC errors by untrained or unscrupulous commercial preparers. Commercial preparers file close to 60 percent of all EITC returns, and the IRS has determined that the majority of EITC errors occur on those returns. Several years ago, the IRS launched an initiative to require preparers who lack professional credentials — the group of preparers among whom EITC errors are highest — to pass a competency examination to be certified to prepare tax returns. A small number of paid preparers challenged this initiative in court, arguing that the IRS lacked the necessary statutory authority to implement it. (Many other preparers supported the IRS initiative.) In 2014, a federal appellate court ruled in favor of the preparers who brought the suit, finding that the IRS needed authority from Congress to implement this error-reduction initiative. President Trump’s budget requests such authority. The principal document that the House Budget Committee chair, Rep. Diane Black, issued to accompany the new budget resolution calls for requiring the IRS not to issue EITC payments before verifying corroborating income information from employer information returns and other sources for each tax return claiming the EITC.This would pose a series of problems. First, it would require the IRS to vastly increase the resources devoted to EITC compliance. Without a steep increase in its congressional appropriation, the IRS would have to divert substantial resources from other tax-compliance activities that have been found to produce higher returns. The proposal might even increase EITC errors if the IRS had to shift resources now used for more intensive scrutiny of questionable EITC claims to rote verification of the income on every EITC return. The proposal also would delay EITC refunds, likely for months, because long IRS processing backlogs would very likely become inevitable. Refunds would be delayed until verification of the income on a tax return was completed. In some cases, the IRS might have to request additional information. And filers’ refunds could be held up indefinitely if an employer were late or made mistakes in submitting information returns. Extensive tax-refund delays can be costly for working-poor families. Research shows that many hard-pressed low-income working families fall into arrears on rent, utilities, or other bills and pay these debts each winter upon receiving their EITC. Harvard scholar Matthew Desmond’s award-winning book Evicted documents the role of EITC refunds in averting large numbers of evictions each winter; substantial delays in EITC receipt would likely result in significant increases in evictions and other actions harmful to these families and their children. Such delays also would likely lead to a return of exploitative “refund anticipation loans,” in which filers essentially use part of their EITC to pay high-interest rates while their refund is being delayed. These delays would come on top of the delays caused by the new program-integrity measures that the IRS began implementing this year. Bipartisan tax legislation enacted in late 2015 authorizes the IRS to take two steps before issuing tax refunds. First, the IRS now can check that the income information that filers provide on their tax returns matches the income information on the W-2s that filers and their employers provide. Second, EITC refund claims must be delayed until February 15 so that this matching to W-2s can occur for returns filed early in the tax season. (The IRS also conducts this matching for returns filed after February 15.) The IRS began implementing this new procedure this year. We did demand — and the Democrats agreed — to include significant provisions to improve program integrity with regard to these credits in order to reduce improper payments going forward. In fact, the program integrity provisions in this bill will be the most robust improvements to address waste, fraud, and abuse in the tax code in nearly 20 years. The IRS reports that $51 billion in refunds for filers claiming the EITC or the refundable component of the Child Tax Credit were delayed this winter due to this provision. In addition, the Government Accountability Office (GAO) reports that there were 51 percent fewer cases of identity-theft fraud on tax returns filed through the end of February 2017 than in the same part of the 2016 filing season, a development to which the new matching procedure apparently contributed. Overall, the new matching procedure enabled the IRS to stop $836 million in refunds that it otherwise would have paid. The IRS is expected to evaluate the new requirement’s impact, including the impact on errors and on IRS resources, following this year’s experience. It would not be sound policy to greatly expand income verification requirements — and cause much longer delays of refunds — before assessing the impact of the several-week-delay policy that took effect this winter. The Budget Committee proposal almost certainly would produce much longer delays than the new W-2 matching process, which is computerized and can be accomplished with delays of no more than a few weeks. By contrast, examining all income information on all returns claiming the EITC would likely require a process similar to that for conducting an audit, which takes considerably longer. The proposal could have adverse effects on businesses as well as low-income working families. As the GAO reports, the Treasury Department and the IRS have noted that even this year’s delay of several weeks in issuing refunds could affect local economies and pose problems for retailers in low-income communities who rely on purchases made when filers receive their refunds each winter. Goldman-Sachs has made a similar observation. The problems associated with the suggested new verification procedures would be magnified for self-employed people, including small-business owners, for whom income verification is considerably more complicated. To verify the income of self-employed filers and those earning business income, the IRS would need to examine the net income that these filers report on their tax returns: their gross business income minus their business expenses, as reported on Schedule C, E, or F. Mandating that the IRS verify all such income before issuing an EITC refund would require self-employed workers and small-business owners with modest incomes to navigate a new series of onerous paperwork requirements. They likely would have to include many more documents with their tax returns — documents that higher-income people with self-employment or business income (a group with a quite high rate of tax non-compliance) do not have to supply. (Moreover, it’s generally difficult to attach separate documents to an electronic tax return, and over 90 percent of EITC returns are filed electronically; such a requirement consequently could force more filers to shift to slower and less accurate paper returns, which are much more expensive for the IRS to process.) The IRS would then have to verify these documents and check them against each such tax return, effectively conducting quasi-audits of the nearly 7 million EITC filers with self-employment or business income. This would affect large — and growing — numbers of self-employed and small-business filers given the emergence of the “gig” economy and the growing number of workers who are employed outside traditional employer-employee relationships. Very substantial numbers of self-employed and small-business people have modest incomes that place them in the EITC range. Many more small-business owners receive the EITC than are in the top income-tax bracket. Adding to these concerns, many low-income self-employed workers are designated as “independent contractors” by those who engage them, but the entities or individuals engaging these workers often do not provide them with payment documentation such as a 1099. Moreover, 1099s don’t have to be provided for payments of less than $600. In IRS audits, self-employed filers can be asked to present logs of their business income and expenses to document their net income from self-employment. This can be a highly labor-intensive undertaking for both filers and the IRS and is appropriate for audits but not for mass tax-return processing. Self-employed and small-business filers are not asked to attach income or expense documents (including 1099s) to their tax returns. The amounts at stake are comparatively small. The average EITC claim is $2,482, and overclaim errors are often a few hundred dollars. In contrast, tens or hundreds of thousands, or even millions, of dollars often are at stake in audits of questionable returns from filers with very large incomes or corporate entities with large profits. In response to congressional pressure, the IRS already audits a much higher fraction of EITC returns than of other returns. This proposal thus would likely cost the federal government money unless the onerous new requirements deterred honest, self-employed workers and other low-income workers from filing for the EITC in the first place, depriving them of the very income support the credit is meant to provide. If You Found The Information Here Was Useful Please Consider Sharing This Page!